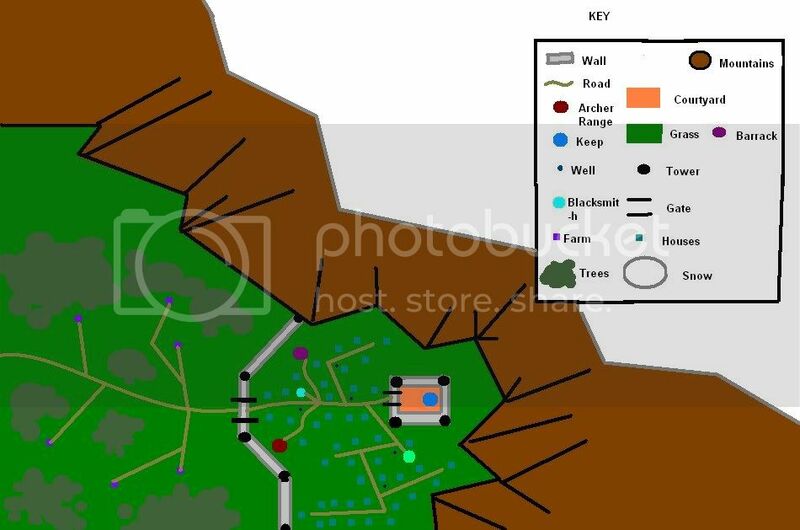 Archian, I were wondering if you could make some template, with the tileset you use in LoC and a set of doodads you wish to use in it. That would make things a lot easier. Sorry, no. You weren't meant to make it in a map. Ok, the proper way, this time. Other Buildings - barracks, stables, etc. Fountain - could be some monument as well. It's on the main square. Higher Ground - it's a castle hill, with a second ring of walls. Castle Hill Tower - this one would be some long range thing, maybe a trebuchet. Lower Ground - the actual city. Houses and buildings should be mostly located along the streets. Street network could be different, of course. The proportions might be bad, but size of things can be changed. I think the plan and the idea is clear. While the way behind, through the forest, is lightly defended, it's narrow, which might be troublesome for the attacker. You want the forest-way to be left ungarded but that single Guard Tower? Just making sure :) I like it this way, makes things more interesting. I feel like putting up a small isolated dock at the end of the road that leads *towards* the viewer :) Would that be okay with you; if I decide to create your idea? Something about gates, how strong are they? Will they be easily destroyed, or will they last a long time? Last edited by snowtiger : 08-25-2008 at 07:37 AM. One tower on the forest side is intended. And one of the forest roads leading to some dock or port would be cool. To be honest, I shaped those forest roads just so they look pretty on the picture, there's no big thought behind them ^^ Just wanted to indicate there's a forest with some paths on the left. snowtiger has the 2nd entry so far. Before I start drawing anything, I'd like to ask. Archian, what would you think about a faction living in the swamps in the backwater of some river and having their base spread among several islands of more solid ground? They'd have superior archers (hunters), maybe poisoned javelin throwers and fast vessels. They could use orcish building models, they'd fit more the wetland terrain. Night Elf stuff would work either, but it looks too... civilized, such faction should be kind of savage. Last edited by Andriejj : 08-25-2008 at 04:43 PM. Well heres mine.I used Microsoft paint if thats ok.
Last edited by The_Koon : 08-25-2008 at 10:57 PM. That looks more like an entire city.